Jeff Christopher Leonard’s debut book, Calling Days, won the Five-Star Seal from Readers’ Favorite and was a Foreword Reviews’ 2014 INDIEFAB Book of the Year Award Finalist. He now presents his new adventure, Mars Away. Jeff Christopher Leonard's Mars Away is set in a futuristic timeline in Earth and Mars in the year 2050. It portrays the inability of planet Earth to further sustain and/or support the ever growing human population. And so it's a race against time for humanity, as they make plans to colonize Mars to ensure the survival of the human race. The scientists have found a way to make the hostile living situation in Mars habitable for human life via a bomb that would trigger a geologic reaction throughout the planet. However, they need someone to detonate it. Enter Devin Xyear, who is daring and has the driving skills to navigate the dangerous terrain of the new planet, but is uninterested in humanity's plan to colonize and move to Mars. Leonard's action-packed, adventure sci-fi novel utilizes a blend of in-depth research on geology and an amazing amount of imagination and writing skill to create something as astounding as this! It is entertaining, fast-paced, and it really got me thinking about the future and what it holds for our fast growing population. It is superbly written and the ideas and explanations presented regarding the colonization of Mars made me really believe that it could be possible. It also delves into the subject of survival in an unknown environment, and the characterization and the development of the characters throughout this hostile environment was also one of the wonderful traits of the book. It had me flipping the pages faster than I thought possible. The end result is that this book has left me wanting and thirsting for more! I can only hope to read the sequel in the near future. Amazing, wonderful, superb job! Mars Away by Jeff Christopher Leonard introduces us to Devin Xyear and the amazing world he lives in. Devin's family has always stated that they would never go to Mars. When the 2050 ship filled with colonists and all the supplies they will need to survive arrives, Devin couldn't care less. He has a fantastic career as a NASCAR champion and plans to stay firmly planted on Earth. Unfortunately when he gets into trouble with the law, Devin is sent to Mars and given a special mission. Earth is dying and will no longer be able to support life. Devin, the fearless NASCAR driver, will have to navigate Olympus Mons and set off a bomb; this is what scientists say will make the planet work with human life. Can he do what he is tasked with and become a hero who is allowed to return to Earth? Or will he fail, dooming those on planet Earth to their fate when the planet dies, and dooming himself to remain on Mars? This is probably the most unique book I have read in 2016, and I loved it. There have been many different books about Mars and how people could live there or were stranded there, but this one seems to breathe fresh life into the story. Who would have thought a NASCAR driver would be the linchpin in a plan to save human life? Devin is an interesting character and my first thought of him was simply that, oh yeah, he is a typical NASCAR driver. He is fearless and more than a little cocky, but once on Mars things begin to change. Wouldn't you feel a change in you if you were on an alien planet and had to help to save the people on Earth? I don't want to give too much of the plot away, but this is an action packed book that keeps you riveted. Jeff Christopher Leonard knows how to spin a fantastic yarn. I can't wait to read more. Mars Away by Jeff Christopher Leonard is a futuristic imaginative tale of a young motor racing professional named Devin ‘Devilspree’ Xyear as he turns eighteen years old in the year 2050. His father had been a professional racer of repute and the son followed closely in his footsteps. The setting is the west coast of America where the project Mars One, which is a neon-red roller coaster powered by super magnets, hovers above the beach and extends nearly a quarter of a mile out into the bay, attracting a plethora of tourists. The first few extremely exciting chapters are about motor racing. Then the hero makes a horrific mistake, with well researched riveting scenarios of legal manipulation, but even as the reader is biting his nails the setting shifts to the planet Mars where a settlement had been created, as a result of the necessity of mankind migrating to the Red Planet because of overpopulation and multifarious generic problems arising on Earth. To attract the most suitable and qualified people to recruit themselves for migration to Mars, a skycast of the imageal promoting Mars was used, called “Mars Away!” To avoid spoilers, I just have to say that Jeff Christopher Leonard opens new vistas of mankind’s future, with fine descriptive writing and the chief protagonist Devilspree’s turnaround to meet what one can only describe as his destiny. The flow of the story is good with unexpected events arising one after the other, none of which seems implausible. The author has used explanatory and descriptive language effectively to enable comprehension of the scenarios to readers unacquainted with the possibilities intrinsically woven around the strange new world of the future. The climax is unexpected in keeping with the theme of the book. I think this book is a good read for people of imagination. The year is 2050 and eighteen-year-old Devin “Devilspree” Xyear has an idyllic life – two wonderful parents who love him unconditionally and a promising career as a NASCAR driver, following in the footsteps of his charismatic forty-year-old father, Derry, also a NASCAR champion, who’s going to be retiring after his last big race – assuming that he qualifies, of course. Devin’s father is prepared to walk away from it all after this last race in order to support Devin’s own racing career and to devote more time to Devin’s mother, who’s dying of cancer and has only months left to live. Devin and his parents live in a beautiful home perched on the cliff overlooking Monterey Bay in Santa Cruz, California, and the only things disrupting the beauty of their surroundings are the annoying imageals, which are 3-D holograms used to recruit volunteers for the next great shuttle to Mars set for later in the year. Mars Away by talented writer Jeff Christopher Leonard is the perfect sci-fi drama for YA readers and lovers of this genre. Somewhat idealistic, Mars Away is an entertaining story that is rife with adventure and daring. Devin is a likeable and engaging protagonist whom the reader cannot help but root for. What makes the story particularly engaging is that although it’s set in the future, there are many elements that are grounded in today’s reality. This keeps the reader fully engaged in the story as it unfolds. Who would’ve thought that sci-fi and NASCAR could make such interesting bedfellows? In any event, Mars Away ticks a lot of boxes and has plenty going for it. A worthwhile read from beginning to end! Mars Away by Jeff Christopher Leonard is a science fiction novel set in the year 2050. Mars Away will appeal most to a mixed audience of adults and young adults who enjoy reading science fiction books. The story follows Devin Xyear, NASCAR Sprint Cup Series champion, as some trouble with the law forces him to assist in the colonization of Mars. Devin Xyear's task will be to utilize his NASCAR skills to navigate Olympus Mons and set off a bomb that will make Mars more hospitable to human life, and allow people to escape from a dying Earth to a life on Mars. The trouble comes with the fact that success means a hero’s welcome and failure means the death of Earth and him being stuck on Mars. Move over Anakin Skywalker, Captain Kirk, and Captain Picard and make room for Jeff Christopher Leonard’s Devin Xyear. Devin Xyear easily became my favorite character in the book as, while he was a reluctant hero, he still had to put his racing skills to the test to save the people of Earth and transform Mars. The setting and the plot were both rather unique and the idea of the hero being a racer instead of some hot shot wild card agent or police officer was very cool. Mars Away by Jeff Christopher Leonard reminded me of a mix between Disney’s Cars, the Transporter movies, and the Transporter TV show with how the protagonist’s main skills were those found behind the wheel. All in all, I really enjoyed the wild ride that was Mars Away by Jeff Christopher Leonard. Don’t judge a book by its cover…or synopsis. I keep forgetting that. I almost didn't read Mars Away by Jeff Christopher Leonard because neither the cover nor the synopsis really piqued my interest. My impression was that this story was probably not good and there must be something better to read. But I told myself to give it a chance; after all, the exploration of Mars is the next big target for NASA and I was in the mood for some near future science fiction. To my surprise and delight, Mars Away turned out to be a great book. It reminded me of all those books that Robert A. Heinlein wrote for teenagers in the 1960s. I read them all. A lot of my generation did. They were great for getting young minds interested in science, reading, and the future. I can say exactly the same for Mars Away. Jeff Christopher Leonard makes Mars Away work. He makes it not only exciting, but totally believable. The characters, especially the protagonist Devin Xyear, are characters you already know or people you would like to meet. The future imagined is easily a future that can become real based on what’s happening right now. Jeff Christopher Leonard does two things extremely well. He moves the adventure along at a brisk pace and he pays attention to the details. Those are two things that an author sometimes finds hard to balance, but in Mars Away, Jeff Christopher Leonard pulls it off like an experienced professional. 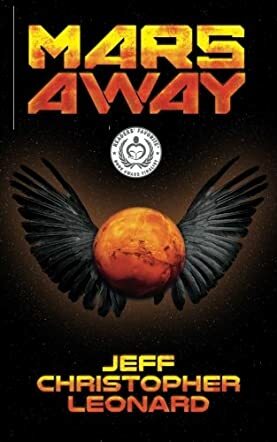 Mars Away by Jeff Christopher Leonard is an interesting read for fans of sci-fi, a compelling story with an interplanetary setting. In a story set against the backdrop of a dying Earth in 2050, readers are introduced to a planetary conflict: Earth may have only a hundred years of survival left. The only hope for Earth’s inhabitants is an exodus to Mars, but how can they survive on a planet that is inhospitable? Scientists have found a way of transforming Mars into a place that can accommodate humans and a brave soul is needed to start the operation that can change Mars into a home for humanity. The NASCAR Sprint Cup Series champion, Devin Xyear, finds himself being given an impossible mission. Having transgressed the law, he is charged with travelling to Mars and setting off a bomb that will trigger a geological mutation. Can he be the hero Earth badly needs and what are his chances of survival? While Mars Away is an engaging and entertaining story, it is a powerful prophetic work with a message that humanity needs to heed. The author seems keen on following the signs of the times and sends a strong warning through this novel that we may lose Earth if we don’t start taking care of it now. His characters are awesome, rock-solid, and very relatable. It is interesting that the protagonist is compelled to undertake a mission that is contrary to everything he stands for — leaving Earth is the last thing he’d have considered, but he is coerced into it. The setting is vivid and readers will feel that the author did his research well. Jeff Christopher Leonard is a skilled writer and the plot is as engaging as the prose. A great read, indeed! Mars Away by Jeff Christopher Leonard opens with the central characters watching the sun set from the balcony of their clifftop home in Santa Cruz, California. Devin ‘Devilspree’ Xyear has just turned eighteen and is enjoying a drink with father Derry ‘Devilhaul’ Xyear, a champion racing driver, and his mother, Dolly. Devin works with his father’s highly successful pit crew and the family is able to maintain a first class lifestyle. The one fly in the ointment at this time is Dolly’s terminal cancer and although she is determined that the illness should not affect their lives, its shadow hovers in the background, an unwelcome, fearsome spectre. Things are about to change dramatically, however, as a series of tragic events finds Devin on Mars, engaged in a terrifying, life-threatening mission to save the planet and the very future of humanity. Sentenced by a kangaroo court, Devin is wrenched from the NASCAR racing world he loves and transported to the barren Red Planet where he must brave the heights of the massive volcano Olympus Mons, on a task that all admit has less than a 50/50 chance of success. The odds are stacked against him, but he must achieve success in order to have any chance at all of returning to Earth. Assisted by the beautiful Mars-born Mevina, can his hard-won driving skills enable him to win through? Mars Away is classic science fiction - a good story line with plenty of action sprinkled with some novel ideas and scenarios. I particularly liked the ‘imageal’ commercials (from my point of view a nightmarish method of advertising, but eminently possible) you will find described in this book. The characters are well-drawn in a narrative which moves at a steady, though sometimes ponderous pace while the author takes time to explain the intricacies of the world he has created. A solid second opus from a relative newcomer to the genre. I enjoyed Mars Away and wish Mr. Leonard every success with it. I look forward to further installments. Mars Away, by Jeff Christopher Leonard, is a story of heroism set in the near future when mankind is struggling to establish a stable colony on Mars. The story follows a young race car driver named Devin Xyear as he is sent, against his will, to be among a crew that will attempt a dangerous mission on Mars. He is a daredevil with lots of heart. Along the way, we meet many colorful characters that are also involved in the plan; some who want to be there and others who don’t. One standout character that emerges is a female named Mevina who, by the book’s end, turns out to be Devin’s match in heroism. There is much to love about Mars Away. Author Jeff Christopher Leonard has done a fine job in crafting a true American hero along the lines of Han Solo or James Kirk (as a young man in the new movie series). The story painstakingly follows his journey from spoiled superstar to a real hero. Mars Away also gives us plenty of juicy details about the Mars colony, its troubled beginnings, its tenuous existence, and the risky mission that must be accomplished in order for it to survive. I enjoyed reading Mars Away for the most part. My only regret is that too much of the story focused on the build-up to the mission and not enough on the mission itself. However, the final climactic chapter was extremely satisfying and left me anxiously awaiting the next book in the series. Mars Away is a strong beginning to what looks like a great new science fiction series. Mars Away by Jeff Christopher Leonard is a sci-fi novel set on Earth in the year 2050. Devin “Devilspree” Xyear is the talented son of legendary NASCAR racer Derry “Devilhaul” Xyear. Like his father, Devin wants to race, race and race. With his father close to retirement, it is a matter of course that Devin will pick up his mantle. Unfortunately, life doesn’t always turn out the way you want it. After his father dies in a swimming accident and his mother slips away from cancer, Devin’s life crumbles around him. His father’s sponsors and team want nothing to do with him and he’s just been arrested for driving under the influence. The only way he can redeem himself is by travelling to Mars and carrying out a deadly mission that could save the human race. One of the things I loved about Mars Away was the use of the familiar things that made the characters very human. When most writers take us to the future, they strip away the things we know and give us something completely different as if the family structure or the Earth will completely collapse as technology advances. When Devin travels from Earth to Mars, Jeff Christopher Leonard gives us a perfect contrast between the two planets. Mars is nothing like the characters imagined it would be. There are so many lessons here, but the most notable are 'be careful what you wish for' and 'what you think you want might not be what you need.' This book is suitable for readers of all ages who enjoy a good sci-fi story. Hopefully there will be more books about Devin “Devilspree” Xyear.